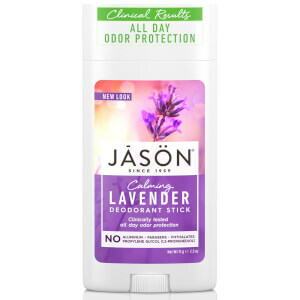 Stay calm and fresh with JASON Lavender Deodorant Stick. Free from aluminum chlorohydrate this soothing deodorant will keep you protected throughout the day. Soothing, safe and providing long-lasting protection, JASON Lavender Deodorant Stick is enriched with lavender oil, vitamin E, shea butter and organic corn starch to provide you with gentle and comforting freshness. Reapply after sweating or any time extra freshness is needed.